If you can’t answer that question, Tom begins, then you don’t know where you’re going. It’s only in the last few years that we realize that paper is a limitation. 1. Vision – the story of the Idea Wall. Tom talks about visiting a school and how they use the idea wall as a way to allow students to pursue and develop passions. By having this wall, students were empowered to express interests and then teachers could guide them towards their passions through inquiry and exploration. When visiting there, Tom saw how all spaces were configurable and desks could move to form a circle. This way, the entire environment fosters collaboration: the mission. This ties in to Design Thinking – “If you plan for learning then the technology falls in place.” Because of the mobility of the device and the mobility of the learning environment, then it’s possible to create an immersive learning environment. Think about using backward planning – start with the learning goals, design assessment tasks, and then develop lesson activities. By having a vision of effective performance, then it was possible to design activities to help attain that vision. By delineating details from a set of learning objectives, then it’s possible to create a rubric or system to provide the guidance to achieve the objective. Rather than starting with a tool, begin with the vision and tasks before going to platforms. This comes down to the question of whether or not the iPad (or other device) is inside or outside of the classroom. Is the pedagogy shifting, and is the learning environment changing? The real challenge is to envision constructive active learning environments. If we are looking at how we can not only consume information in multiple modalities, but also how students can represent that knowledge and understanding through various modalities, then we are using iPads to provide a pathway to universal learning. “We have to realize that we will have diverse attitudes and aptitudes” says Tom, so we have to build up and support all teachers. For some, that may be starting at the Substitution level while for others it could be jumping directly into creativity and innovation. Once teachers begin to see the potential for themselves, then they can start to see how they could empower their students as creators and reach a diverse range of learners beyond the 2D, static, print-based world. “If we all contribute, then we all benefit.” With iPads, it’s possible for students to become creators and curators of content to benefit each other. As an added benefit, this allows students to begin forming learning communities to support each other as well as interdependence. There is a cycle of experiment and experience. Oftentimes, when looking at technology, there are associated fears that manifests itself in a variety of ways. So as schools, we have to provide an opportunity for teachers to fail. 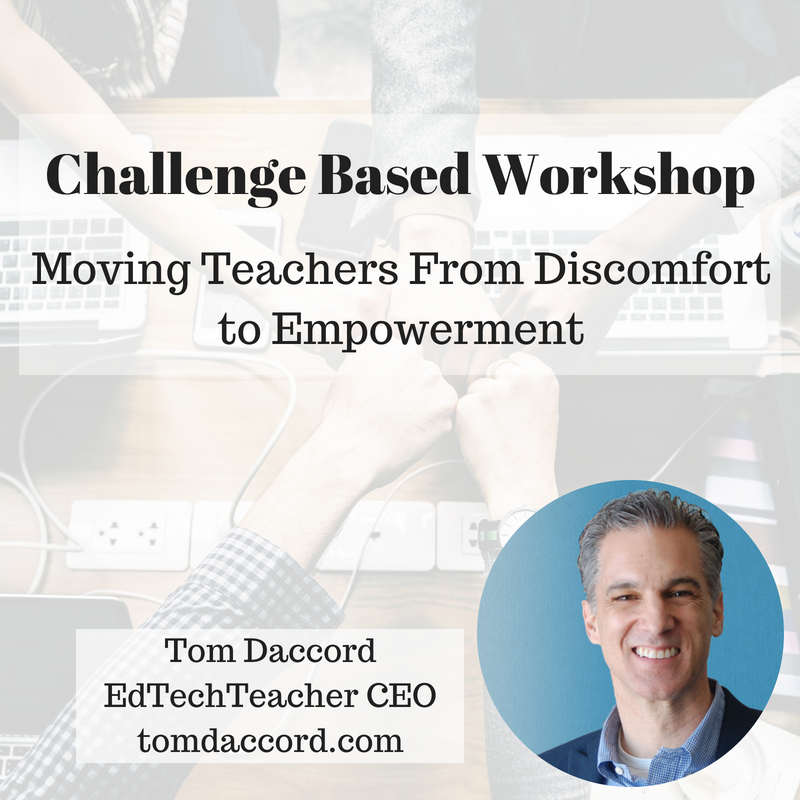 At EdTechTeacher, we do this through challenges so that teachers can fail early and fail often. In turn, this builds confidence going forward. An institution that allows for failure, and supports it, then growth and institutional capacity can be built. “Is technology having a positive impact on learning?” Asks Tom. In many ways, we cannot separate the tool from the instruction, but we can identify the goal and then create a system where we gather data on the performances. Before using technology, Punahou school asks teachers WHY technology? HOW will it help students learn? WHAT is your learning objective? Throughout the process, they interview the teacher as well as the students. Based on the answers, the school can then determine the effectiveness of the project or activity. In turn, this creates a repository of best practices for the school that other teachers can access and evaluate in order to continue to build institutional capacity. For change to really happen, teachers need sustained professional development which is why we do the T21 program. Teachers then feel supported over a long period of time, but also get just-in-time feedback through the blended learning environment. For real demonstrative, instructional change to happen, a study has identified that it takes a minimum of 50 hours of dedicated professional development. This also then develops a cohort of teacher leaders. At the end of the year-long program, teachers can develop a professional learning plan and then become change agents. Tom says it comes down to how the theory and culture manifests itself in terms of the ultimate objective. “Those who teach kids, and not the subject, know that it’s ultimately about helping kids to learn.” The goal is to prepare students with competencies for the future, which mitigates the content and allows teachers to think about the big picture learning. It has to come back again to the fundamental question of what does learning look like? The thing, though, is that every school has its own culture. Ultimately, though, is how the cultures can translate. Leadership is critical at this phase because a system that works in one place may not work in another. Similarly, the administrative capacity needs to support the mission and culture of the school. For example, a leader who wants the teachers to collaborate needs to collaborate as well. There are a multitude of small ways that administrators can show that they support because actions speak louder than words. Administrators who are involved in their own professional growth, learning from others, and are willing to experiment, demonstrate the habits and performances that resonate with teachers. While ultimately school leaders need to make the decisions, listening to the community and reaching a community consensus supports the efforts.